Wheelchair Accessible Vehicles (WAVs) must meet a range of important requirements to ensure the safety of passengers. all of the equipment is maintained in good working order. 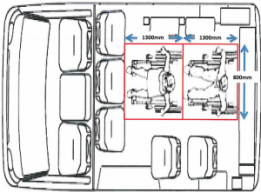 This forms part of the duty of care in the supply of commercial passenger vehicle services to people in wheelchairs. 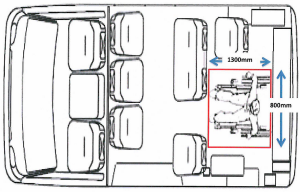 Each wheelchair position (allocated floor/ceiling space) must be allocated at least 1300mm (length) x 800mm (width) x 1500mm (height) as required by the Commonwealth Government's Disability Standards for Accessible Public Transport (DSAPT). occupant restraint system (seat belts). lap and harness type assembly. A lap only seat belt is not a compliant restraint system for people in wheelchairs. Wheelchairs must be securely tied down at four (4) points. Wheelchair restraints must be free from fraying, tears and knots. All restraints must be installed to ensure a universal correct fitting and comply with the applicable Australian/New Zealand standards*. have approach edges with an outer roll stop that is effective when the hoist is raised off the ground. Any ramp fitted to a WAV when commencing service, must have a gradient (slope) no steeper than one in six (1 in 6) and a width of no less than 800mm. Hoists and ramps should be serviced regularly by the manufacturer or its agent to ensure the equipment remains in good working order. Hoists and ramps must comply with the applicable Australian/New Zealand Standards^. We continue to inspect WAVs to ensure they comply with the standards. This includes making sure each WAV has the correct type and number of restraints to match the number of wheelchair positions. Failure to comply with the WAV requirements may result in compliance actions against the vehicle owner and/or driver. For any enquiries contact us. A new Wheelchair Accessible Vehicle Driver Handbook will soon be available on the website. Follow CPVV eNews for updates.